Get your copy of In The Image of Man - Book One of The Unseen Dominion Series! By purchasing your hardcopy through CreateSpace you are making the highest level of contribution to Living Water International possible. The eyes are the window to the soul . . .
. . . but what if the eyes ﻿are empty? When Officer Chris Davis, of Arrow Springs, Missouri, rescues a ﻿young woman from a mysterious attacker, he steps into the center of a spiritual showdown. Following his heart, and a trace of circumstantial ﻿evidence, he embarks on a collision course with a government research facility and an unseen foe. Twenty-five years later, THEY'RE READY! Whether intentional or not, humanity often walks that line first crossed by Lucifer himself—the desire to become equal with God. 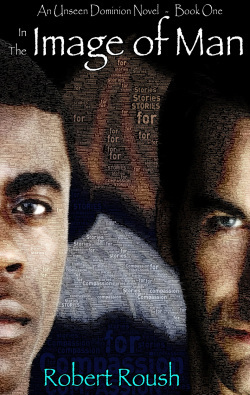 In The Image Of Man is a supernatural thriller for adults that gets the reader to ponder the ethical question, “If mankind succeeds in cloning humans, an attempt at creation, will God endow the clones with souls?” More important, the reader is encouraged to ponder his or her own soul as the book reflects on God’s restoration of relationships. Ultimately, God is the God of creation, and of re-creation.